The food pyramid is designed to represent the relative amounts of each type of food to consume daily for optimum nutrition. Actually, the relative amounts are more representative of the degree of congressional influence by the powerful manufacturers of each type of food. The agriculture industry, which primarily produces wheat, has had the greatest influence—the entire base of the pyramid is devoted to breads, rolls, rice, crackers, cereals, and pasta. If you look closely at the base of the pyramid, you will have the option of using your imagination in determining whether the grains, flours, breads, pastas, and bakery items represented are made from whole-wheat. However, once you are in the supermarket, just try to find these items in whole-grain form. If you find any whole-wheat pasta—which is highly unlikely—it will most probably have an unpleasant, rancid taste. That is why the flour is refined, namely, to remove the most nutritive part, which can quickly become rancid or attract insects and vermin. The reader may be interested in Consumer Reports’ comments† concerning the USDA’s conflict between protecting the public health and promoting the interests of the food and medical industries. The reported interference by the American Medical Association to the adoption of governmental dietary goals is particularly distressing. 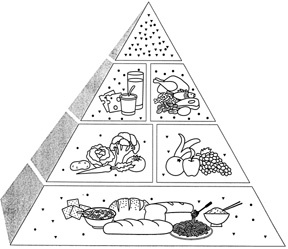 Assume that the food pyramid is two-dimensional (that’s the triangular view that we see) (Fig. 1). Then we can assume that the area of each food group is proportional to the relative amount that is suggested to be consumed in the American diet. Consider the pyramid shown below (Fig. 2). Triangles identical to that of the top level have been drawn so that the relative area of each of the four levels can be found by counting the triangles in that level. Fig. 2. An isosceles triangle, broken down to show the relative area of each of four levels corresponding to that of the food pyramid. 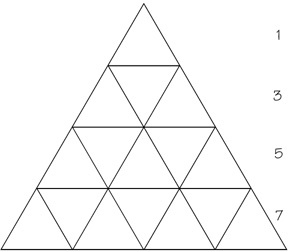 The top level has one triangle, the next level has three triangles, the next-to-bottom level has five triangles, and the bottom level has seven triangles. The total area is, therefore, 1 + 3 + 5 + 7 = 16. The top level, corresponding to junk food, occupies 1/16 of the total area. The next level, corresponding to dairy and meat, etc., has an area of 3/16 = 3/32. And so on. Note that junk food, pasta, bread, crackers, and rice comprise 50% of the suggested American diet! Fig. 3. Three-dimensional food pyramid. 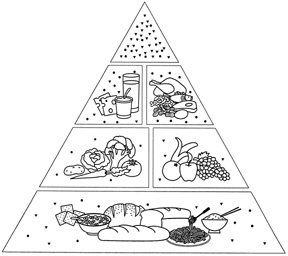 Now assume that the food pyramid is really what it is shown as—a right pyramid with a square base (Fig. 3). Then we can assume that the volume of each section is proportional to the amount of that group recommended for the American diet. The relative volume of each level now is not as easy to calculate and requires the formula V = hA/3, where h is the altitude and A is the area of the base of the pyramid. The same formula can be used to calulate a section of the pyramid that includes the apex. The volume of the top level (which is a pyramid of height h/4 and base area A/16) is hA/(64)(3). The volume of the second level can be obtained by subtracting the volume of the top level from the volume of the top two levels together (which is a pyramid of height h/2 and base area A/4). And so on. The results are: If the top level is considered to have a relative volume of 1, the next level would have a relative volume of 7. The next-to-bottom level would have a relative volume of 19, and the bottom level would have a relative volume of 37. The total relative volume is, therefore, 1 + 7 + 17 + 37 = 64. The top level, corresponding to junk food, occupies 1/64 of the total volume. The next level is broken into two equal volumes, corresponding to dairy and meat, etc. Thus the combined volume of this level would be 7/64. And so on. Note that junk food, pasta, bread, crackers, and rice now comprise a whopping 59% of the suggested American diet! †Consumer Reports, October, 1991, p. 666.